Explore ancient mysteries with The Curse of the Dark Pharaoh (Revised Edition). This updated and revised version of the 2006 Arkham Horror expansion adds a terrible threat to your game in the form of the Dark Pharaoh and his mysterious artifacts. With new Exhibit Item and Exhibit Encounter cards, players can uncover the artifacts that have gone missing from the museumâ€™s current â€œLegacy of the Pharaohsâ€� exhibit. But beware! The Dark Pharaoh will not let his treasures go so easily. The Avatar of Nyarlathotep himself joins the fray with the Dark Pharaoh Herald sheet, spreading his curse throughout the game. 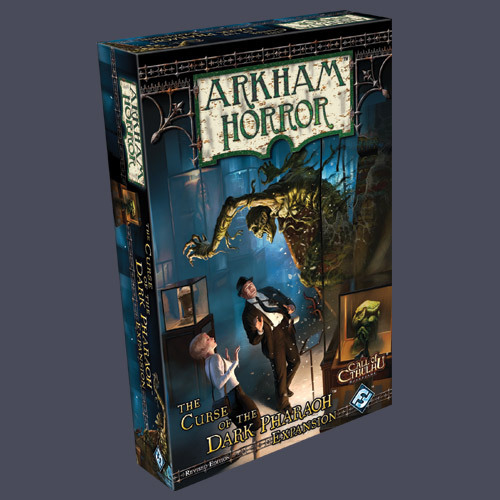 Finally, The Curse of the Dark Pharaoh (Revised Edition) also adds Patrolled Neighborhoods, Benefits and Detriments, and Ancient Whispers, all creating additinal layers to your games of Arkham Horror. NOTE: This expansion is compatible with the Miskatonic Horror expansion. This was the first of the expansions released for Arkham Horror. For those who have either played the original Arkham Horror to the point they know every card by heart, or those that have crossed the point where base Arkham Horror is a little too easy, this expansion adds new variety and increases the difficulty. Of all of the expansions, Curse of the Dark Pharaoh is the most basic. It introduces the least new rules and systems to the game, which makes it easier to learn and adjust to quickly. On the other hand, it provides less of an increase in variety and difficulty than the other expansions. This expansion was designed for playing in two modes. 'Permanent exhibit' basically involves shuffling the new cards in with the base game cards of the same type, and thus having only occasional influence on the game. The 'Travelling Exhbit' method of play entirely replaces some base game decks with expansion cards, or in some cases keeps the expansion and base game cards of the certain types separate and draws alternately from one pile then the other. This provides a much more drastically changed experience to the base game. I believe Pharaoh was the only expansion to utilize this sort of mechanic directly (though theoretically such a system could be house-ruled for any expansion). All in all, a worthy addition to Arkham Horror. Not necessarily the first expansion to pick up, but certainly worth acquiring if you enjoy the game. Curse of the Dark Pharoah is a good second expansion to the base game - it's easy to integrate and rather than adding a new core mechanic to the game adds a new deck of item cards (exhibition items) as well as new additions to many preexisting decks. If you're concerned about overloading your game with expansions, this is a safe way to expand your cards and add a few new little things as bonus. I believe the Curse of the Dark Pharaoh expansion allows for a drastically alternate game as well as the standard add-on play, but we've always used it in the conventional method. An excellent expansion to Arkham Horror! The new Exhibition cards and new location cards with this expansion make it worth the purchase and play!